(for DIY Cola Bottle Candle) - 11 white candles (2 for the top and 9 for the "body"), 2 crayons (1 black and 1 brown), empty Cola bottle (500 ml), a nut (or something small and heavy), a toothpick (to hold a wick), a washdish with cold water, a pan with water and a smaller empty pan (for a double boiler method). (for DIY Fanta Bottle Candle) - 11 white candles (2 for the top and 9 for the "body"), 3 crayons (2 orange and 1 yellow), empty Fanta bottle (500 ml), a nut (or something small and heavy), a toothpick (to hold a wick), a washdish with cold water, a pan with water and a smaller empty pan (for a double boiler method). (for DIY Sprite Bottle Candle) - 11 white candles, 3 green crayons, empty Sprite bottle (500 ml), a nut (or something small and heavy), a toothpick (to hold a wick), a washdish with cold water, a pan with water and a smaller empty pan (for a double boiler method). 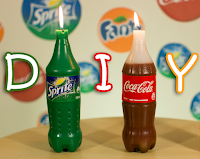 Watch my video tutorial to understand exactly how to make these Coca-Cola, Fanta and Sprite Candles. How to wash a pan from wax - warm the pan up, fill it with a bit of oil, take a paper napkin and wipe warm wax off. What is a double boiler method - it is a slow and careful boiling method for melting chocolate, wax, butter etc. Just fill a pan half-full with water, put smaller metal pan into the first one, bring to a simmer and wait till your candles melt to liquid.